Emory's newest graduates will continue to be able to use the university's extensive library collections. Physical and virtual access to the Emory Libraries is one of the many privileges enjoyed by alumni. As newly minted alumni, the Class of 2017 needs to know a few details about alumni library privileges. First, new Emory graduates received an alumni card during Commencement events. With this card, Emory alumni in the Atlanta area can use the Woodruff Library when they are on campus to check out books (with lifetime borrowing privileges that require yearly renewal). Staff at the service desk can log in alumni, which allows them to access specific software in the Learning Commons, as well as access to most databases and online resources. 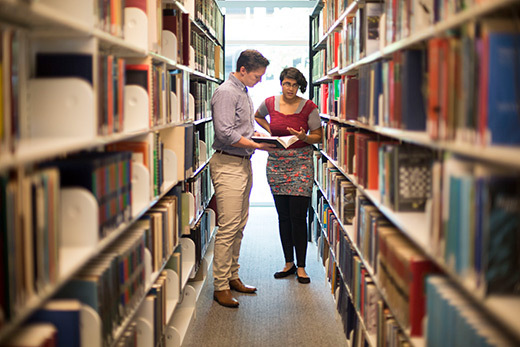 Subject librarians are also available to alumni if they need a consultation on research in a specific discipline or subject area. Alumni can also conduct research in the Pitts Theology Library and the Stuart A. Rose Manuscript, Archives and Rare Book Library. For other Emory Libraries, alumni should contact those libraries for more information, notes Stacey Gall, Emory Alumni Association’s (EAA) alumni services manager. For Emory alumni who will be moving away from Atlanta, the EAA provides access to several online databases, including the latest full-text information in many areas of academic, business and health-related fields. For alumni who plan to stay in metro Atlanta or Georgia, local public libraries can offer interlibrary loan services, as well as many online article databases, genealogy research and other research tools via GALILEO (Georgia Library Learning Online). You can also use a new free tool, Unpaywall, which legally links to free scholarly journals from open access journals and university repositories, including OpenEmory. Alumni who have trouble accessing a database should contact Stacey Gall at the EAA at sgall@emory.edu.